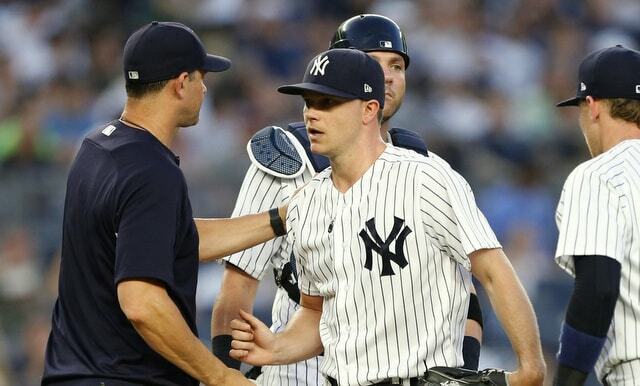 It is January 14th and Sonny Gray is still a New York Yankee. He’s been on the trade block all winter, and, at one point, as many as eleven teams were in on him. The Yankees reportedly whittled that list down to the best possible suitors, but once CC Sabathia had his heart procedure, trade talks slowed. Gray could be necessary rotation depth. Interest in Gray persists, however. Jon Heyman reports the Reds are still after Sonny despite reports to the contrary earlier this offseason. A few weeks ago Cincinnati was said to be fading out of the picture after acquiring one-year rentals Tanner Roark and Alex Wood. The reasoning was they wouldn’t want to give up more prospects for another one-year rental. That said, Reds pitching coach Derek Johnson was Gray’s pitching coach at Vanderbilt, so there is a connection in place. And besides, the Reds could use more rotation help. In the deep NL Central, they’re going to need more than Roark, Wood, Yasiel Puig, and Matt Kemp to have a shot at contention. A few thoughts on this Grays/Reds stuff. 1. The Yankees apparently want pitching prospects now. Earlier this winter the Yankees reportedly asked the Reds for outfielder and top prospect Taylor Trammell in Gray trade talks. That was never going to happen, but hey, you can’t get what you don’t ask for, you know? Start with a high asking price, and if the other team doesn’t blink, adjust down. That’s what happened here. Heyman says the Yankees are now focusing on upper level pitching prospects in talks with the Reds, specifically right-handers Tony Santillan, Vladimir Gutierrez, and Keury Mella. MLB.com ranks Santillan as the fifth best prospect in Cincinnati’s system, Gutierrez the eighth best, and Mella the 11th best. Baseball America (subs. req’d) ranks Santillan and Gutierrez fifth and ninth best, respectively, with Mella outside the top ten. His plus-plus fastball sits 94-98 mph with late life. It can be a heavy fastball that is difficult for hitters to square up. He works off his fastball with a future plus slider that has good plane and tight break, though it morphs into a cutter at times. While his firm 85-88 mph changeup lags behind the other two offerings, he does show some feel for it and throws it with deception and fade … (Important) control is important for him to reach his ceiling as a mid-rotation starter. A physically large (6-foot-3 and 240 lbs.) righty with a huge fastball? Yeah, sounds like someone up the Yankees’ alley. Gutierrez, 23, had a 4.35 ERA (4.09 FIP) with 23.2% strikeouts and 6.1% walks in 147 Double-A innings last year. Baseball America calls him a potential back-end starter. The 25-year-old Mella has been an up-and-down guy the last two years. He’s a fading prospect with a fastball/slider combo that probably fits best in the bullpen. Mella is Cincinnati’s Chance Adams, kinda. Anyway, the Yankees were never going to get a top prospect like Trammell for Gray. Now they’re apparently targeting the next best thing, which is upper level pitching depth. They have a ton of lower level pitching prospects and they’re largely set on upper level positions. There’s no such thing as too much pitching though, so that’s where they’re looking. They asked for Trammell, the Reds said no, and now the Yankees have lowered the asking price. It is the natural order of negotiations. 2. The Yankees say they’re willing to keep Gray. But I don’t believe them. Not based on the way they’ve been talking about him the last few weeks and the palpable frustration that was evident every time he was discussed last season. The Yankees tried everything. They gave Gray his personal catcher, they changed his pitch selection, they changed his role. Nothing worked. The Yankees are ready to move on. It’s best for everyone, really. Because of that, I don’t think the Yankees are serious about keeping Gray. They’ve determined he can not succeed in his current environment, and if that is true, then he’s not really rotation depth, is he? If the expectation is a 5.00 ERA going forward, well, you can find that for cheap in free agency. Francisco Liriano, Jason Hammel, and Josh Tomlin all strike me as swingman types who can be had on the cheap. I think the Yankees are done with Gray. All that talk about keeping him following Sabathia’s procedure was just an attempt to create leverage. 3. Gray is quite a bit cheaper than expected. I had a feeling this would happen. Gray’s 2019 salary is considerably lower than projected. MLBTR projected a $9.1M salary. Sonny signed for $7.5M. For the Yankees, that $1.6M difference is less than 1% of their projected payroll. It’s still $1.6M in real money, and for a team with a projected $110M payroll like the Reds, that’s quite a bit of cash. Gray’s below projected salary makes him more affordable to everyone. The Yankees if they keep him and interested trade partners if they deal him. 4. The Yankees are already over the luxury tax threshold. And this could mean one of two things. One, the Yankees will say screw it and keep spending. Maybe not Manny Machado or Bryce Harper, but Adam Ottavino or another reliever. Or two, the Yankees could now be operating under a mandate to reduce the luxury tax penalty as much as possible, thus making a Gray trade a necessity. My hunch is the reality is somewhere in the middle. My quick math has the Yankees’ luxury tax payroll at $219.5M, assuming Luis Severino wins in his arbitration hearing. That doesn’t leave much wiggle room under the $226M second luxury tax tier, the tier that kicks in a surtax and moves their top 2020 draft pick back. Perhaps the Yankees are willing to blow by that $226M threshold. Would be cool. If not, trading Gray will be a prerequisite to doing anything further because a guy like Ottavino ain’t taking $5M per year. Trading Gray for salary relief and an upper level pitching prospect or two would be a pretty good outcome in my opinion. Sonny’s value is down, there’s no doubt about that, but it is not zero. Personally, I’d be cool with keeping him as a swingman/spot starter. I don’t think the Yankees are okay with that though. They seem ready to move on. Whether it’s the Reds or another team, it still feels like only a matter of time until Gray is moved, even if things are dragging on longer than expected.